Amaechi was born in Ubima, Ikwerre Local Government Area of Rivers State to the family of late Elder Fidelis Amaechi and Mrs Mary Amaechi. He was raised in Diobu, a densely populated neighbourhood in Port Harcourt, and had his early education at St Theresa’s Primary School from 1970 to 1976. He earned his West African School Certificate in 1982 after attending Government Secondary School Okolobiri. The lure to improve his lot amongst his peers took him to the University of Port Harcourt in 1983, where he graduated with an honours degree in English Studies and Literature in 1987. University of Port Harcourt was where he laid the foundation of his political life, participating actively in student union politics, especially in the National Union of Rivers State Students (NURSS) of which he was President, and the National Association of Nigerian Students (NANS). On completion of his National Youth Service in 1988, he joined the services of Pamo Clinics and Hospital ltd., owned by the former Executive Governor of Rivers State, His Excellency, Sir Dr. Peter Odili where he worked as Public Relations officer until 1992 when he joined partisan politics emerging as the Secretary of the National Republican Convention in Ikwerre Local Government Area. He completed the mandatory National Youth Service in 1988. He thereafter joined the Services of Pamo Clinics and Hospitals Limited owned by Dr. Peter Odili, the former Governor of Rivers State where he worked until 1992. 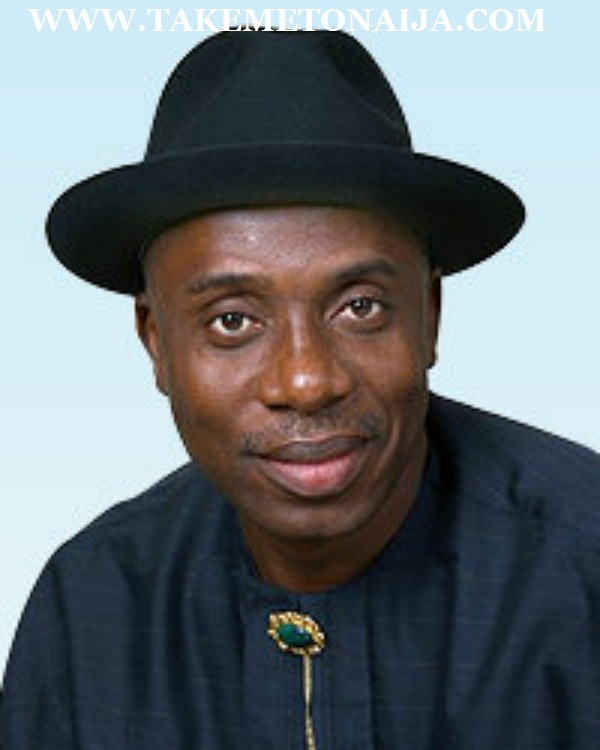 He is married to Judith Amaechi and they have three boys. succeed Peter Odili as Governor in 2007. He was the Rivers State’s Secretary of the Democratic Party of Nigeria (DPN) caretaker committee after in 1996 during the transition programme of General Sanni Abacha junta. the State House of Assembly. He was reelected for a second term of four years in April 2011.
punishment of those who fight corruption.” Specific allegations included “$20 billion is alleged to have gone missing at the Nigerian National Petroleum Corporation (NNPC) just as both fuel and kerosene subsidy have become questionable. In 2015 Amaechi was appointed the Director-general of the All Progressives Congress (APC), Presidential Campaign. After leading the presidential candidate Buhari to victory, he was later selected to be a minister in 2015 by president Buhari. Read ALSO: Bishop DAVID OYEDEPO Full Biography,Life And News. Rotimi has won several awards as a governor.